We feel like it is a match made in heaven; Neil Gaiman and Chris Riddell, author and illustrator. Their works go hand in hand, Chris’ peculiar illustrations perfectly complementing Neil’s bizarre writing. We believe each one of their cooperative works is to be cherished, and should be shared with those who yet need to discover them. Listed below are our favorites! 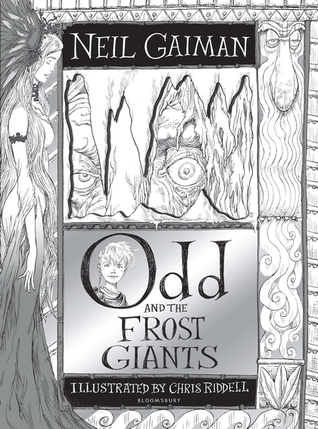 Odd and the Frost Giants is a lovely little children’s tale with beautiful illustrations by Chris Riddell that perfectly fit the nordic themes. In a nordish world set in the past, Odd is the son of a viking raider. Unlike the other vikings, he is small and weak, but has the wit of many. His mother has remarried and his new stepfather cares little for the young boy. Yet in this cold and endless winter Odd sets out to an adventure. By misfortune he breaks his leg and becomes disabled, but despite his struggle he finds a bear in the woods, trapped. An eagle and a fox join them shortly. Odd sets the bear free and finds out his newly found animal friends are actually the gods his kind believe in. Odin, Loki and Thor. Together they go on an adventure to free Asgard from the frost giant they’ve been tricked by. The mythology in Odd and the Frost Giants was easy enough to understand by children, but fun for adults nonetheless. Especially if you like Norse Mythology. If you don’t.. honestly, why don’t you? You might even learn a thing or two, if you don’t know much of the norse gods. The silver, black and mostly white illustrations were a perfect fit and addition to the wintery cold theme. You can almost feel the cold! They alone are worth the little effort of reading this book. It made for a perfect december read that was even somewhat inspiring, even though it broke our hearts in a couple of pages. So no matter how old you are, this little beauty is worth your reading time and little shelf space! The illustrations in The Sleeper and the Spindle are in similar style as those in Odd and the Frost Giants. 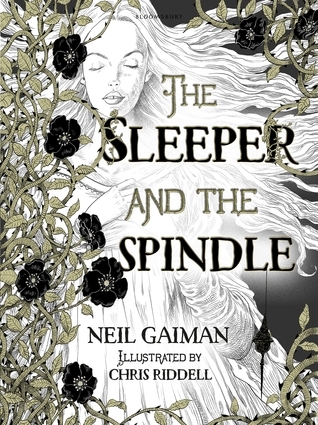 But instead of the cold atmosphere those add to Neil’s story, the illustrations in Sleeper and the Spindle give us a real magical feeling, using gold accents instead of silver. A fairytale feeling more like a tale of Grimm rather than Disney. Dark, yet eccentric and leaving you spellbound. The story itself is original and not your typical fairy tale. It’s unpredictable and has a feminist focus. The Sleeper and the Spindle is a retelling of sleeping beauty, in which Snow White is the hero. There is no prince, and the villain isn’t who you think she is. The Sleeper and the Spindle has a beautiful ending with a big twist that make it an easy single sitting read. Beside these two fantastic reads, a set of three Neil Gaiman classics have been released as a boxset, published by Bloomsbury. It contains Coraline, The Graveyard Book and Fortunately The Milk. The latter being the most light and over the top children’s read in this box. The nightmare invoking Coraline is once again freakishly beautifully complemented by its illustrations, whereas in the Graveyard Book they add a more calm form of darkness, a ghostly feeling. Lastly, the modern classic Neverwhere has been re-released last year as an illustrated hardcover, featuring a fully illustrated extra short story. We’ve not been able to get our hands on this version, yet. But according to Charlotte, the non-illustrated version alone is worth this magical tale of London. We certainly hope Neil Gaiman and Chris Riddell collaborations won’t end here. Have you enjoyed any of these versions as much as we have? Thank you!! They are very lovely indeed, you should read them all! The blog looks really cute girls! Love iiiiit! Previous Previous post: Welcome to our blog!